Soulfire Rifles are sniper rifles employed by Hive Adherents on the battlefield, and occasionally by Kamus Acolytes. Soulfire rifles are powerful sniper rifles that are exclusively employed by Adherents, subvariants of Acolytes. Guardians should take measures to avoid fire and seek nearby cover at all costs, as these rifles can cripple their shields. 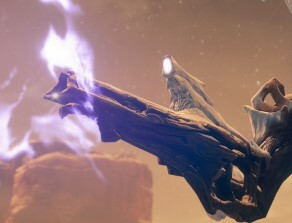 Similar to the red aiming laser of the Cabal Headhunter rifle, a mottled black-purple 'beam' will indicate the intended target of a Soulfire Rifle. Guardians that notice these beams converging on them should seek cover or engage in other evasive maneuvers; as with the Headhunter shots, Soulfire Rifle rounds have travel time and can be dodged. Much like the Cabal Headhunters, a humming noise can be heard just before they fire.